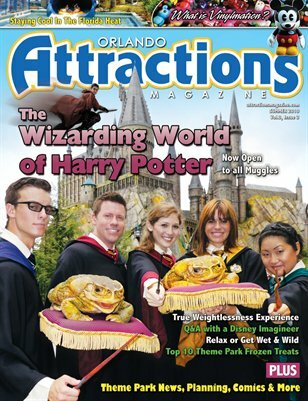 FEATURES • The Wizarding World of Harry Potter: This most anticipated new area is now open. We tour it with the designers. • What is Vinylmation? : Here’s what you need to know about Disney’s newest collectible craze. • Zero-G: Come with us for a first-hand look at going weightless. • Get Wet & Wild: An in-depth look at Orlando’s original water park. • Top 10 Theme Park Frozen Treats: Stay cool in the Florida heat with these top treats. • Q&A with a Disney Imagineer: Gary Landrum is responsible for preserving the magic.